When I was at the Prodeco headquarters I had a chance to test ride their Titanio 29er (pre production model), Outlaw SS (pre-production model), Phantom X, and Stride e-bikes. The test rides were pretty short and it was on completely flat terrain but it gave me an idea of what these bikes are like. Titanio 29er (pre production): A titanium electric mountain bike? Yes and it is pretty lightweight (31.8 lbs.)! Titanium is one of the highly coveted frame materials for die hard mountain bikers. 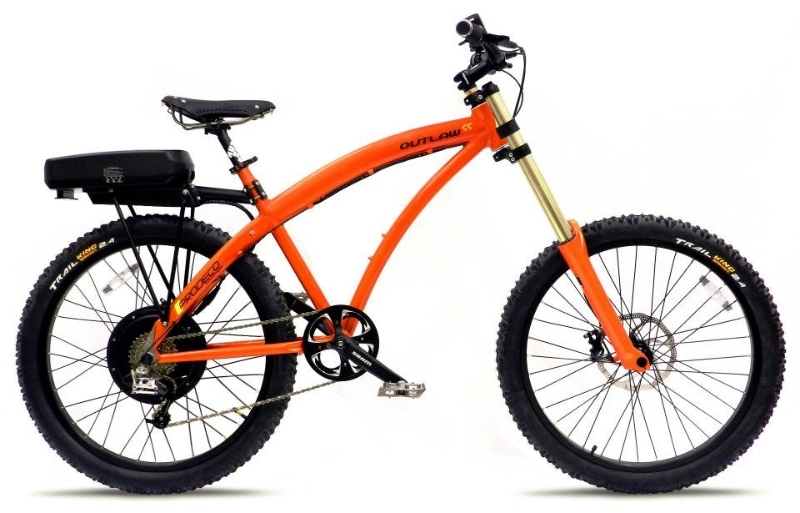 This e-bike had a 200 watt front hub motor (production model will have 250 watt) with a 33V 6.2Ah ULW Pan 27 Cell Battery housed in a water bottle. 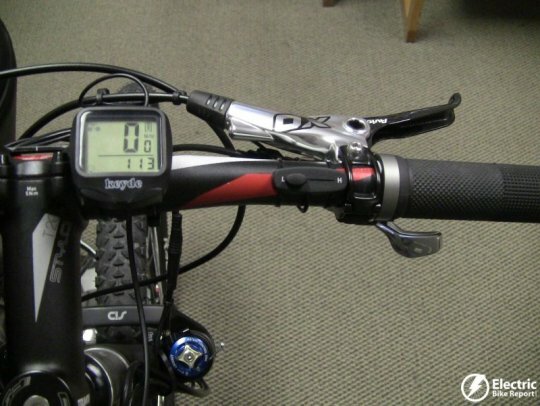 This is a pedal assist only bike (no throttle) and you can vary the assistance via a sliding dial on the handlebars. 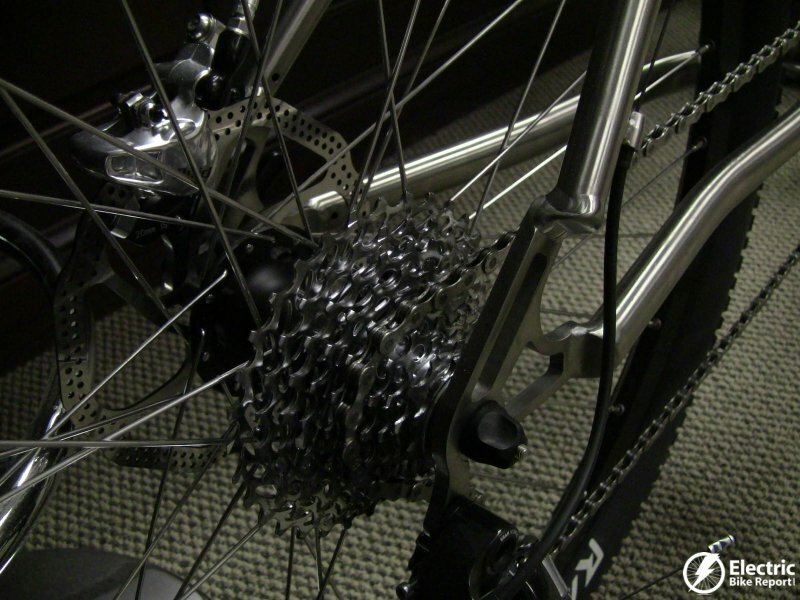 Overall, this bike is decked out with some really nice components and the titanium frame is pretty sweet. The pedal assist seemed to be pretty smooth and it appears that this will be a nice e-mtb for someone who just needs a little extra help climbing the hills. Since the bike is relatively lightweight, the handling of the bike did not seem to be affected by the electrical components. Outlaw SS (pre production): Whoa, this bike is fast! Maxing out at 28 mph and 750 watts of power, this bike goes above the 20 mph speed limit for street use. Hence, the Outlaw SS is built for off road use only. 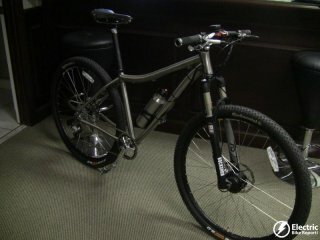 This bike also has a big 140 mm travel, dual crown suspension fork made by Zoom that gives the bike a chopper feel. You can adjust the height of the fork to change the angle of the front end if desired. Overall, this bike felt like a lightweight off road electric motorcycle compared to most other e-bikes. 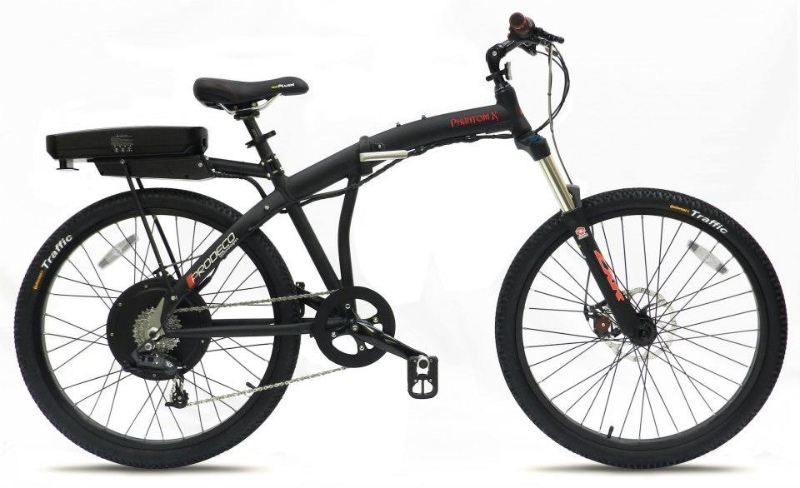 Phantom X (2012 model): This is one of the classic Prodeco models that has a mountain bike style yet it is also a folding bike. With a 500 watt direct drive rear hub motor this bike can really get up and go. The Phantom X felt like it would be great for commuting around town and it could also be used for light duty off road adventures with some off road tires installed. 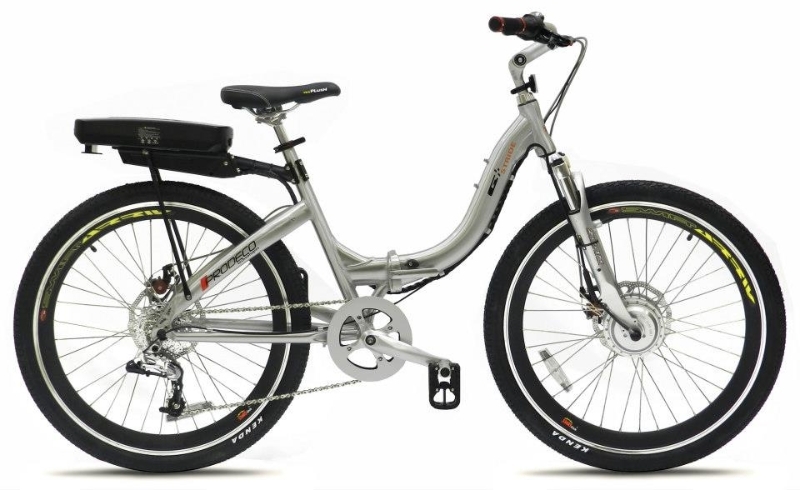 Stride (2012 model): The Stride is a bike designed for ease of use. It was very easy to get on the bike thanks to the step through frame and the ride was pretty mellow with a 250 watt front hub motor. 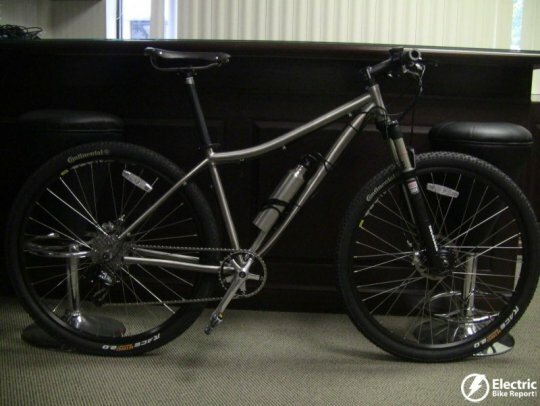 This would be a nice bike for commuting around town or enjoying a nice cruise on the weekend. How Can Prodeco E-Bikes Be So Economical? Prodeco has been known for offering a lot of e-bike for relatively low costs. One of my main questions was how they can do this, while employing U.S. workers to assemble the bikes? Robert explained that the core of the Prodeco business plan is to provide quality electric bikes at reasonable prices. By maintaining high quality bikes with less returns/repair issues they can keep their expenses low and pass the savings on to the consumer. Since they assemble their bikes in house they can quality check their bikes at many points along the assembly process. They have strict quality control on the components they use. If the part is not good enough they will not use it on the bike. According to Robert, bikes that are assembled in Asia pay 2 taxes that can add significant cost to each bike. Since Prodeco builds the bikes in the US, they can avoid these taxes. Prodeco buys in bulk from their suppliers and has a large warehouse to store the parts. They have over 3 million parts on hand to build bikes and supply dealers with replacement parts within 24 hours if needed. They purchase parts directly from the manufacturers so that there are no middlemen distributors involved that could markup the price of the parts. Prodeco is using components from SRAM, Avid, TruVativ, Velo Saddles, Zoom, Promax, KMC,Continental, and Kenda. 80% of the bikes will have Continental tires. These are well know brands in the bike world. 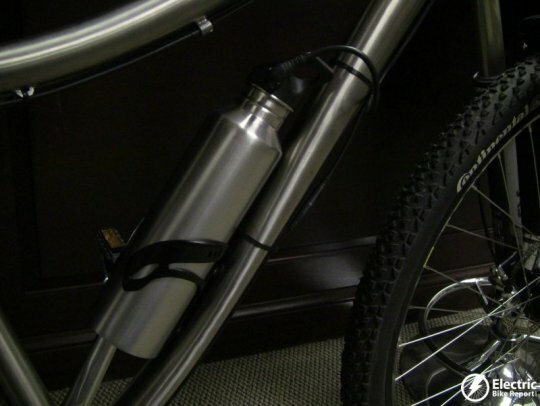 A lot of their bikes share the same type of parts that reduces expenses (the battery rack for example). 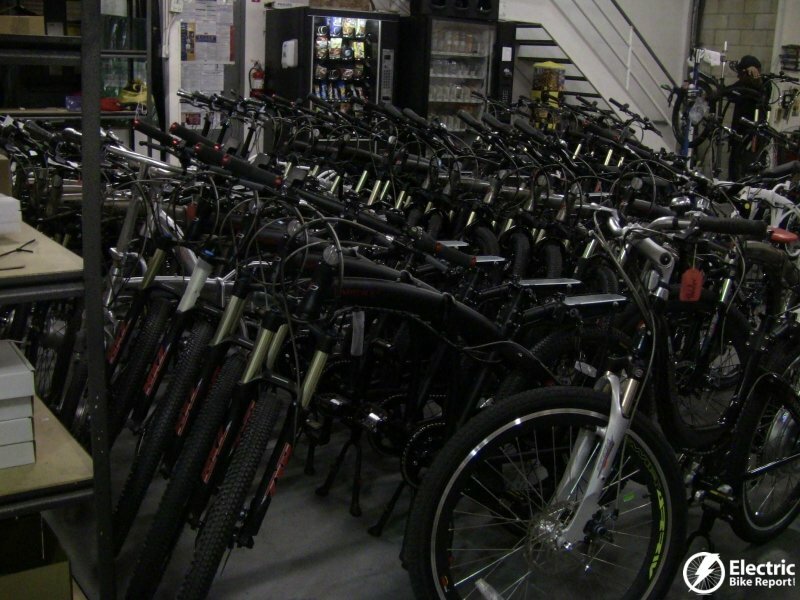 In fact, there are only 340 different parts that are used across 22 bikes in the Prodeco line. Since Prodeco does not have a dedicated sales department, they do not pay sales commission costs. All of these factors help to bring the overall price of Prodeco electric bikes down. Prodeco is constantly improving the way their bikes work but they also focused on making sure the new parts will work on existing bikes. 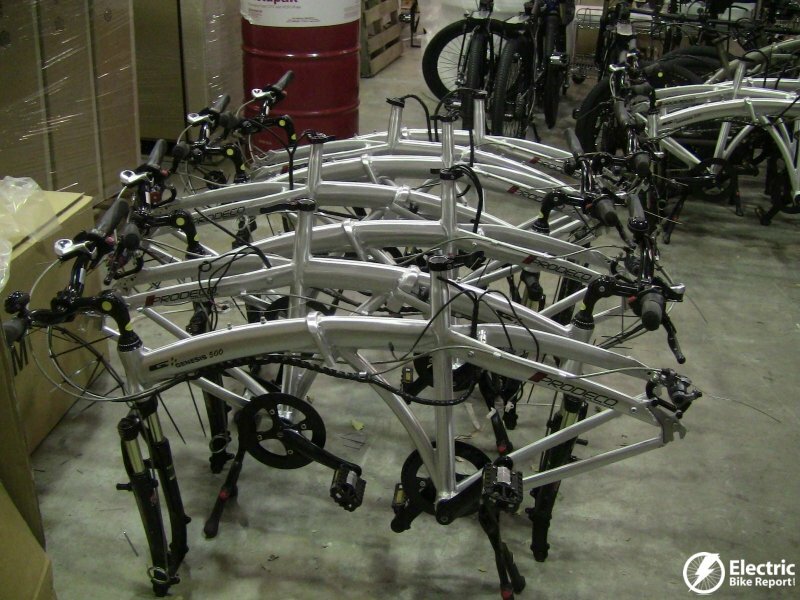 For example: they are building a rack system that will go over the top of the battery pack to protect it from a fall and provide rails to mount panniers and bags. They will be providing these to dealers for distribution to existing customers. They also chose components that are bike shop friendly. By keeping things standard bike sizes it helps traditional bike shops service Prodeco bikes. The electrical components are very easy for the dealers and/or customers to replace. Prodeco bikes offer easy disconnect wiring at the motor and controller. The controller is easy to replace by simply unplugging the wiring and removing 4 screws to detach it from under the battery pack. 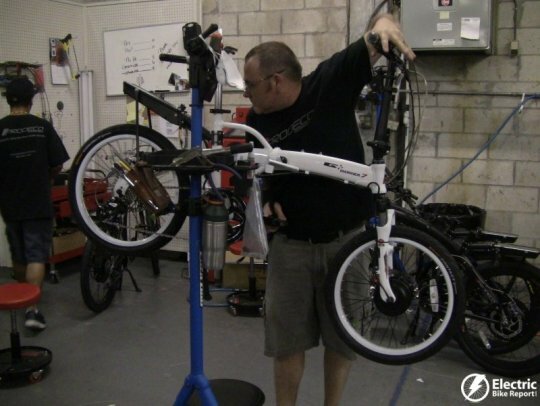 The engineering team at Prodeco is always working on ways to improve the quality of bikes and assembly techniques. 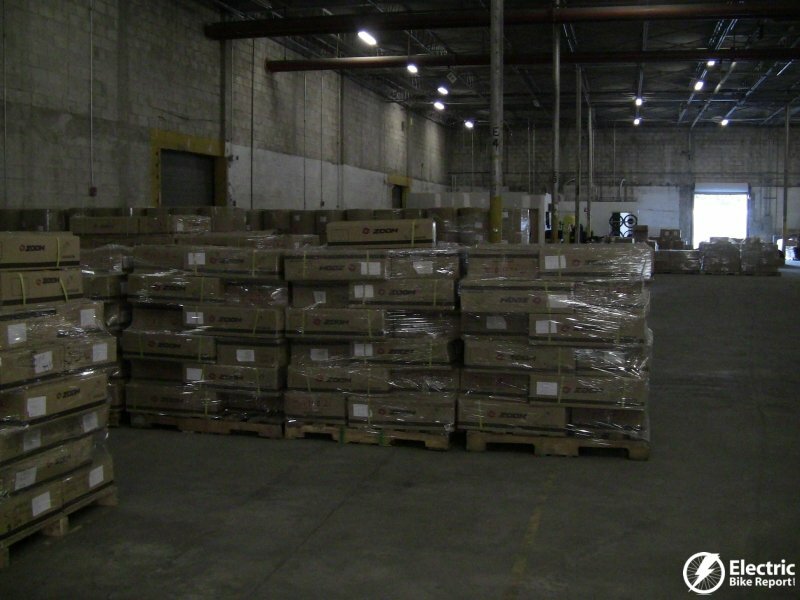 Their new facility will be very organized to optimize operations and a safe work environment. 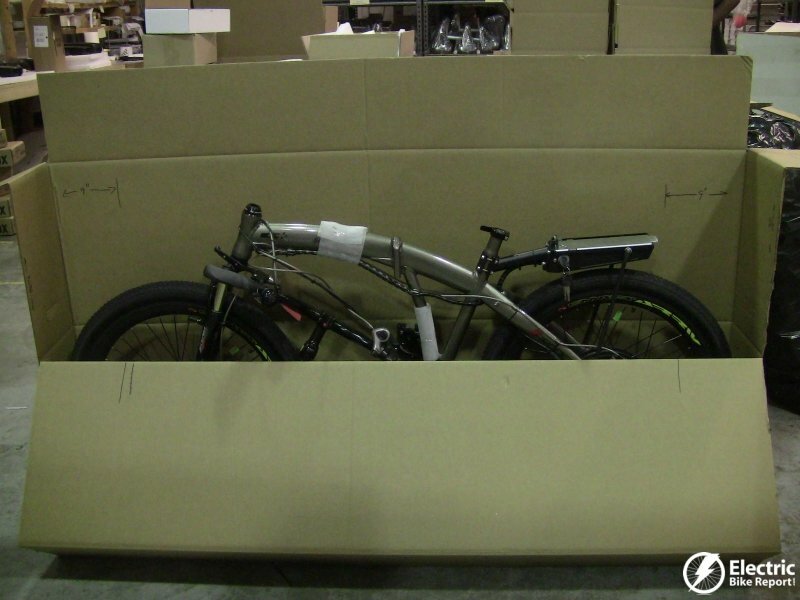 Prodeco recently improved the way they package their bikes. They are shipped with both wheels on and the only thing the dealer or customer has to do is install the stem, seatpost, and pedals. Normally shipping a box that big is expensive but they have worked out a deal with FedEx to make it more economical. What about the warranty? For the first 30 days; parts and labor are free. There is a lifetime warranty on frame and brake pads, 2 years on everything else including the motor, controller and battery. Well that about wraps it up. My visit to the Prodeco headquarters was very educational and it was great to see e-bikes being assembled here in the US. I hope that this report gave you some insight as to what is happening at Prodeco Technologies. 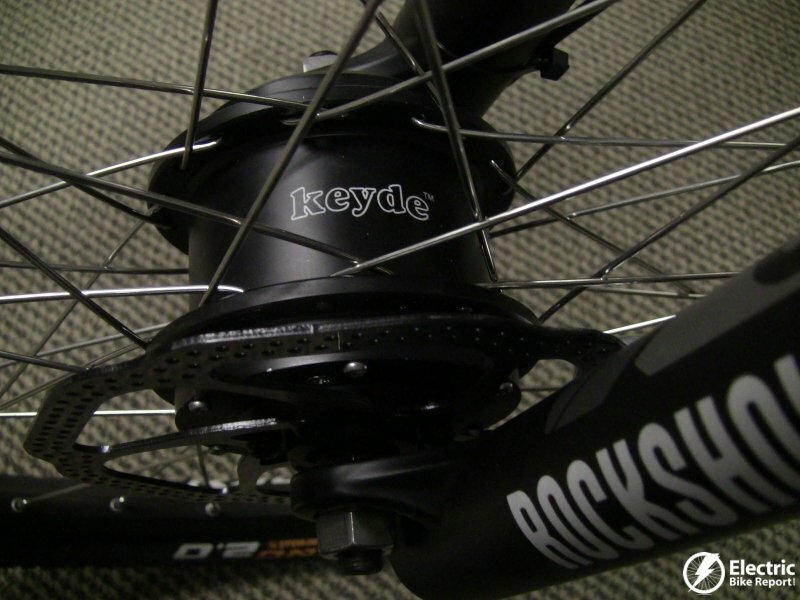 Stay tuned for full reviews of Prodeco electric bikes! If you have any questions or comments please feel free to leave them in the comment section below. Great to see your review of Prodeco. If you ever get the chance, a larger review of the Outlaw SS would be fantastic and I’m sure a fun one to do. I check your website quite often for your updates and appreciate your site. Yes, I may be doing a review of the Prodeco Outlaw SS soon. Stay tuned! I am glad you enjoy reading EBR; thanks for your kind words. I have the Prodeco PhantomX2 (more powerful battery, more range) and have put about 1500 miles on it during the past three months or so. I needed a bike that I could use for heavy commuting, since I make two or three round trips a week of between 40 and 60 miles. That’s why I invested in a second (and now) a third battery, which I carry in a backpack if I don’t have time to recharge during the trip. The only real problem I had was with the 60 thread tires which gave me repeated goathead flats. I switched to 120 thead tires with sealant and have had far, far fewer problems. It’s a heavy bike (but about normal for an e-bike) and though you can pedal it without power, it’s a strain to do any sort of incline and even on a flat surface it is a workout. But with the battery I can go everywhere at pretty decent speeds, pedaling all the time, averaging around 22 miles an hour. I also swapped out the saddle for a larger, cusherier one, and equipped it with Magic Shine lights (that way I can get even with the cars who hit me with their brights) and an odomeer. The thumb throttle is a bit of a pain, especially in cold weather, and I would really appreciate cruise control which I had on my old electric bike. What I would also like (and I may have to build it myself) is a rack that can set above the battery to hold a spare battery. All and all, it is a good bike, a great bike at the price, and does pretty much what I need from an ebike. Do you know where I can get the new rack for the phantom X2? I couldn’t find it online anywhere.